At the beginning of each episode of the original Torchwood series, Captain Jack Harkness proclaimed, “Torchwood: outside the government, beyond the police. Fighting for the future on behalf of the human race. The 21st Century is when everything changes and Torchwood is ready.” This statement captured the excitement and allure of the original series, hinting at the significance of the rift in time and space that just happened to be located in Cardiff, Wales. Likewise, the seventh episode of Torchwood: Miracle Day, “Immortal Sins” is when everything changes and the various threads of the season are gathered together in a simply masterful and superb manner. Any doubts that I might have had up to this point simply dissipated in what is possibly the best Torchwood episode I have seen to date. “Immortal Sins” opens up at Ellis Island, New York City, 1927. A man responds to the call of the immigration inspector for a ‘Jack Harkness’. Seconds later, Captain Jack Harkness (John Barrowman) comes barrelling through, toppling the man and accusing him of stealing his visa. I would refer to him as the ‘real’ Jack Harkness but we all know that is not true. And so we meet Angelo Colasanto (Daniele Favilli), an Italian immigrant that Jack ultimately assists in entering the United States and with whom he falls in love. Much of the episode focuses on their tender and passionate love affair as Jack helps Angelo to come to terms with his sexuality. Meanwhile, in present day, Gwen Cooper (Eve Myles) tases Jack and bundles him into a car. In the first of several powerful scenes featuring Gwen and Jack, Gwen explains that the lenses are in her eyes, that she is being monitored and that they have her husband, mother and child. As we weave in and out of the story of Jack and Angelo, Jack offers himself in place of Gwen’s family but no further communication is offered through the lenses. Jack tries to negotiate with Gwen to untie him and very nearly succeeds, only to be met at the last minute with the full extent of Gwen’s rage. She explains that she loves him but would not hesitate to sacrifice him to save her daughter. Referring to his new state of mortality and his need to preserve his own life, Jack rages back, “I love you Gwen Cooper but I will rip your skin from your skull before I let you take this away from me.” This is powerful stuff and the battle lines are drawn as Jack and Gwen’s relationship is challenged to the limit. Throughout the episode, we witness as Jack infiltrates the operation of New York mobster Salvatore Maranzano. He tries unsuccessfully to get Angelo to leave before contemplating that, like The Doctor, perhaps he, too, can have a companion. Together, Jack and Angelo discover a box that is protected and feared by mobster Maranzano, although he has no idea what is inside it. The box contains a brain parasite that has been sent by The Trickster Brigade to alter the course of history. It is intended to cause Franklin Roosevelt to yield to the demands of Nazi Germany and allow them to win. Jack destroys the brain parasite but this sets off alarms and Jack and Angelo are soon cornered. Angelo watches as Jack is shot in the head and he is captured and driven away as Jack appears to die. A year later, Angelo is released from prison and is horrified to find that Jack is still alive. As they struggle to rekindle their relationship, Angelo is overcome by the horror of witnessing Jack’s death and he stabs him in the stomach. Jack, of course, survives but his survival is witnessed by the landlady and her butcher husband. In some of the most gruesome scenes featured in Torchwood to date, Jack is taken to the butcher’s premises and repeatedly killed in front of blood thirsty crowds, only to suffer and die and come alive, again and again. As three mysterious men negotiate Jack’s purchase, we cut to the present day where Jack and Gwen arrive at a location in the desert and Gwen asks Jack about the most beautiful thing he has ever seen. As the episode reaches its shocking climax, Jack is betrayed in a way that will alter his relationships forever and the two storylines in “Immortal Sins” come crashing together, finally revealing who is behind the miracle. As the end credits began to roll, the first thought that crossed my mind is that I simply cannot wait for next week for the story to continue. This is the first episode of Torchwood: Miracle Day that I have been compelled to watch twice before I could even begin to make sense of it. There is so much that happens and this episode has far more to do with the overall Torchwood and Doctor Who universe than any in the season so far. Like the episodes of the first two seasons, this episode featured a primary enemy, The Trickster’s Brigade. For viewers not familiar with both Doctor Who and spin-off The Sarah Jane Adventures, I imagine that Jack’s mention of The Trickster’s Brigade as the entity behind the brain parasite might not have meant much. For those of us that remember the absolute havoc that The Trickster wreaked in the lives of Sarah Jane Smith and Donna Noble, the name invokes a special sort of terror. Of course, by the end of the episode, a far greater enemy emerges, one that reaches across the whole Torchwood narrative and forms the basis of Torchwood: Miracle Day. As I finished watching “Immortal Sins” for the second time, I began to experience a couple of doubts and was concerned by what seemed to be discontinuity within the show as a whole. It seems important to place this episode within Jack’s timeline. After all, the coat that he wears and the name he goes by were both stolen from an American World War II volunteer by the name of Captain Jack Harkness in 1941. “Immortal Sins” is set in 1927 in New York City and Jack requires a visa to enter the city. Captain Jack Harkness was a time-travelling conman who first appeared in episode nine, series one of the rebooted Doctor Who, during the London Blitz . He then became a second companion for the rest of series one, joining The Doctor and Rose in their travels through time and space. At the end of series one, Jack is separated from the TARDIS crew and stranded on Satellite 5. He uses his Vortex manipulator to transport back to Cardiff and arrives in 1869, but the Vortex manipulator burns out. With no ability to move through time or space, Jack must remain in this timeline until he can meet up again with The Doctor. He joins the Torchwood Institute in 1899 and is thus on Torchwood business, without the ability to travel through time or space, at the beginning of “Immortal Sins”. At the start of this episode he has been on Earth for almost 60 years but originally travelled back in time from around 5100 AD. I think the timeline adds up but am sure to spend the next couple of days dreaming up further possible plot holes. For now, I will say that I have been pleasantly surprised by Jane Espenson’s script and am almost ready to forgive her for “The Dead of Night” and “The Categories of Life”. Following what has been a disappointing and frustratingly slow-moving season to date, “Immortal Sins” proves to be a powerful and riveting episode that draws in aspects from the entire universe of Doctor Who and the related spin-offs. I’m excited about the various threads of the Torchwood: Miracle Day storyline coming together in the final episodes and look forward to the fears expressed in my review of “Dead of Night” being proven wrong. 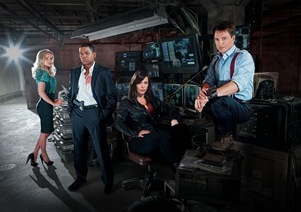 Article first published as TV Review: Torchwood: Miracle Day – “Immortal Sins” on Blogcritics. Agreed - IMO this was the best episode of the series by a mile. It felt like Torchwood, had plenty of Jack in it and brought everything together nicely without revealing too much. Halfway into the episode, I was worried we'd find out nothing about the Miracle (and it felt like we'd almost abandoned that storyline completely) but it really came through in the end. Top stuff. @ Ben: It was a great episode. I'll be interested to hear what you have to say after Thursday!